The Sprinkle gave us an opportunity to crown Benson as the Official Big Brother. He perched on a chair and was recognized for the upcoming earthquake about to rock his four-year-old world; a little sister! There was a gift ready for him, but to our surprise, thoughtful friends brought him presents too. It was a mini-birthday situation for this paper-crowned-confused kid. He leaned into his mom and asked "Why did they pick me?" HA! 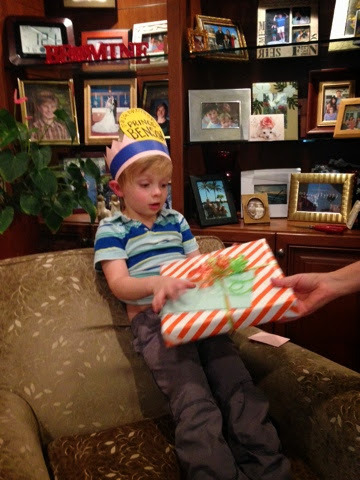 Bewildered, with a sea of women watching, he happily opened the gifts, then headed to watch Daniel play basketball. Benson doesn't realize what is about to collide with his life. How can he? 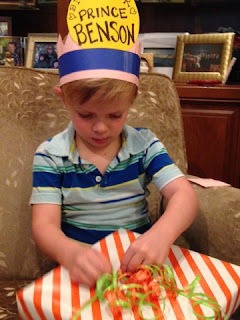 He is four! When Daniel came along, Lucas who was 31/2 at the time, did not like his brother stealing any of the attention. More than once, I had to tell him to move away from the camera so I could get a picture of Little Daniel sitting in his shadow. That first kid can be such an attention-hog! Now, it's Benson's turn to learn what many older siblings before him have .. IT'S NOT ALL ABOUT YOU! Funkle Lui tosses Benson around while he gets lost in a fit of laughter. My prediction? He won't love that life lesson, no kid does. I also presume that the funkles and adoring aunties will pick up the doting-love-slack while his exhausted mother cares for an infant. Everyone in our clan wants to hang out with this super-charged-non-stop-sports-loving-hilarious-fit-throwing-curious-darling-little boy.